Sabrina Ghayour and food, food, food - I can't stop thinking about her food! So, I was sitting there writing my sequel to ‘Friendship, Love and Apple Tea‘ earlier and noticed my stomach rumbling… and rumbling… and rumbling… and I realised something…I seem to write a lot about food. And I mean a lot! Then I realised that I also think about food a lot. And I read about it too and watch many cookery shows and… well, I guess it’s one of my passions in life. When finances allow, I coerce the rest of my family to eat out with me, rarely choosing standard British food but preferring instead either a) Turkish b) Persian/Iranian c) Spanish or d) French. The same type of cuisine I cook most, if not every, day at home. My novels feature my two loves – food and travel. ‘Friendship, Love and Apple Tea’ was based in Turkey (Marmaris) and involved quite a bit of meze eating. And wine. Actually yes, my books involve my three loves – food, travel and wine. The sequel (due out in May) is set in Spain, another country that I love and have visited a lot with my family, and so it features tapas, paella and, well yes, wine… Fresh, colourful vegetables, succulent seafood, dips and fresh bread. Nom, nom, nom. Food is on my mind most of the day. It’s not that I’m obsessed with eating as such, I’m just fanatical about tasting new flavours and fresh dishes, plus trying out new recipes. 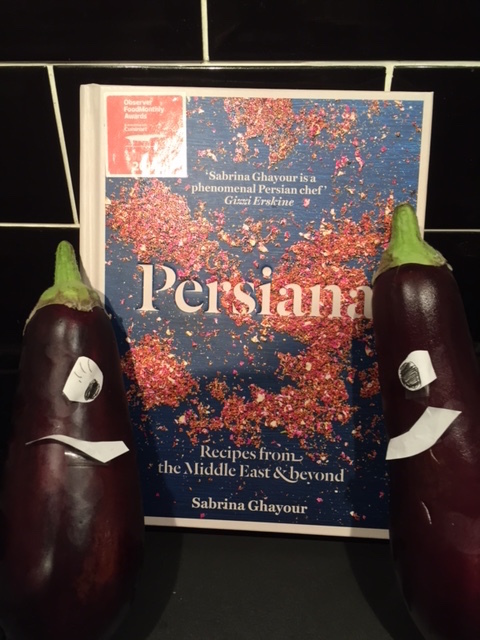 I have many cook books and am currently obsessed with recipes by Sabrina Ghayour – if you haven’t seen her on TV, or read her books, check her out on her website (she’s fabulous) and also her books on Amazon (Sirocco and Persiana – I took this photo of the book next to two aubergines with faces on – why? Well, why not…and, whilst we’re on the subject, how long is there going to be a shortage of this lovely purple veggie in the UK? I miss them so much). In fact, I am so obsessed with Sabrina’s meals that we’re going on one of her cookery classes in May. Yay! Can’t wait. My favourite restaurants and food have been in Spain and Turkey, and we try to find the equivalent in the UK whenever possible. For Turkish food, we visit a local restaurant in Milton Keynes. It’s called the Mediterranean Grill (or Grill Med) and is on the old Watling Street near to the Milton Keynes Bowl at Furzton and next to a carwash. Yes, not the most exotic location and, from the outside, it’s hard to picture what it might be like but please give it a chance – the food is gorgeous and you won’t be disappointed. Well, unless you go right now – It’s closed for refurbishment unfortunately. Ali and his family are hard-working, honest cooks, who go out of their way to give you a great dining experience with freshly prepared, home-made food. 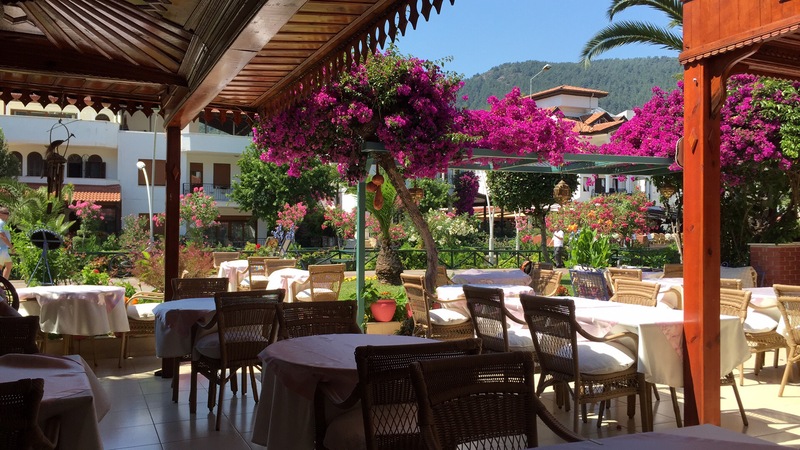 It’s so typically Turkish in terms of places we like to eat when visiting Turkey itself – informal and relaxed. Love it! For Spanish, well, there’s quite a few tapas restaurants around that we like but, by far the best for us is in London Soho and called ‘Jamon Jamon‘. It’s tucked away just off the main street (near to where the Harry Potter play is on at the mo). It’s relatively small although there is a large area downstairs too, and is great for sitting outside when a little warmer. The dishes are authentic, the owner and staff friendly. There’s a gorgeous little cod dish they do which is in a sauce and, combined with the Spanish Rice, makes a very filling meal. We’ve often said that it’s the best tapas we’ve tasted outside of Spain. Anyway, must dash and do some novel writing but may have to stop for some food first. See, my writing has made me hungry again! Next Next post: Title [Tick] Book cover [Tick] Blurb [Tick]… all set for release early June!